It’s Yard Sale time in Springfield & what’s old is once new again! But, with that limited-time label, and the added pressure of these being some highly coveted items, it may be overwhelming trying to decide which items to buy and what to pass on. But, have no fear! That’s where we come in to tell you what’s worth your donuts & what you might want to hold off on. 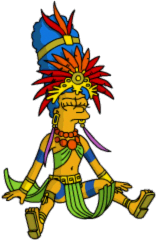 Wondering if you should add a little Mayan fun to your Springfield? Well before you hit that confirm spend button, let’s break down the pros and cons of adding this dooms day trio to your Springfield…. -Once Limited Time Characters/skins (from WAYYYY Back to Halloween 2012) now available again. -Calendar does not add a bonus multiplier & it can be large and awkward to place in your town. I purchased it. (are you surprised?) I’m a completest, what can I say? 😉 However, this was the ONLY items in the yard sale that I didn’t currently have, so it was easy to justify. These characters are from a time when I didn’t play TSTO (I started on my iPad in very early December 2012…and started again on my Android during Whacking Day 2013), so for me it’s awesome to have these TSTO “artifacts” in my game. I love Mayan Marge, and the premium rate she earns. She’s got some fun animations & I really like the colorful skin! PS…I DO think the 90 deal for Mayan Marge IS worth the donuts….if you have the other characters & the donuts to spare. Whatever items you decide to purchase just remember they’re all LIMITED-TIME, so come August 4th they availability to purchase them will be gone! So choose wisely! What do YOU think of the Mayan Combos? Will you be making the purchases? Or did you already have them from before? Did you purchase Mayan Marge? Sound off in the comments below, you know we LOVE hearing from you! This entry was posted in 2014 Yard Sale, Buildings, Characters, Donuts, Should I Buy, Tips and Tricks, Updates and tagged How Do I Get the Mayans in Tapped Out?, Mayan Combo, Mayan God, mayan homer, Mayan Marge, Tapped Out Tips and Tricks, The Simpsons Tapped Out, TSTO Addicts, TSTO Tips and Tricks, TSTO Yard Sale 2014. Bookmark the permalink. Looks like something crazy happened for me. I bought Mayan Marge, but don’t have a Mayan Homer option and Mayan Marge’s questline is locked and can’t start. Very frustrating to be limited to only partial tasks. Any suggestions? Thanks, A! Sorry to bother you on a Saturday…enjoy the rest of your weekend. Sounds like Mayan Marge will be a pass for me then, which is probably just as well. I really wish this was less expensive. I might buy it for 150-200 donuts IF the Mayan god was a playable character and IF the calendar added to my percentages. When I think of what else I could buy for 300 donuts, I’d choose something else every time. I got all of it! This is my only spurge in life! I don’t get out much but I sure LOVE to go to Springfield! I’m not quite a completest, but I was really excited to see this option. I love the stories. I’m not entirely sure what I expected in terms of quest/storyline but I was woefully disappointed. 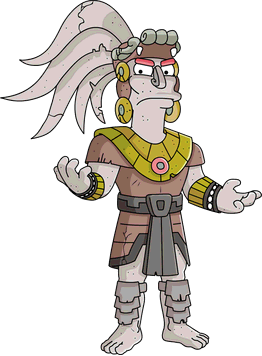 I knew that I wouldn’t get to play the entire Halloween 2012 event, but Mayan Marge’s new storyline was very short and there was nothing of the past storyline for Mayan Homer and Mayan God. Now I’m gun shy about buying anything else from the Yard Sale. 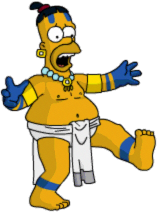 So… Mayan Marge’s 8 hour task is with Homer? Like Maude’s 8 Hour and Hugs Bunny’s 8 hour? They couldn’t have made this task be 4 hours or 12 hours? Looks like I won’t be buying Mayan Marge after all. If you are spending then this is the package to get. New skins and there is a lotta skin, new tasks new decoration and a new character to stalk your town. I have buyers remorse when I realised that Mayan clock does FA and that Mayan God is NPC – I would have been better spending less than 300 on Cool brown house and cool homer, bare chested willie and ninja homer with decoration – that’s what I get for NOT doing my homework! So so so soooo happy this came back! I have been wanting all this Mayan stuff since I started playing the game early this year. 300 donuts was way too high of a price tag but it was worth every little sprinkle. Love this! Thank you EA, you got this one right!! This is one thing that I was really thinking about, I’ve got the full pack on offer at the moment, but seeing as neither the God or Calendar do anything it seems a little pricey so now I’m not sure! ! I got the ice god foot thing straight away as the bonus payout was really worth having, just having a mull over the ‘skins’ and the CBH. Might wait until your ‘should I buy’ on those as we have some time. I would love to see the CostMo Foods store added to the game. It would be a nice addition to the Sprawl-Mart store. I just went and redeemed some credit card reward points for a $50 iTunes gift card. Hopefully it will arrive before August 4th! I say the Mayan package is worth it. The whale is 300 donuts, but at least with the Mayan package has 4 things that come with it. It took the Mayan God nearly 2 years to finally make a return. It’s going to be a while for it to come back. 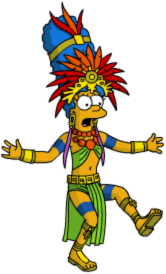 Mayan Marge is what I’ve been waiting for, that’s why i really wanted to buy it. I jumped on the cool brown house and character skins right away. I’m undecided on the Mayan combo, at 300 d’oh-nuts it’s a bit much. I will most likely get them considering they are from so far back and chances are they might not be back for a long time. Purchased Marge. That was the only thing I didn’t already have. I’ve been playing since July/August 2012. I wonder if they’ll bring back the super collider and the black hole. Those are some of the only items that not a lot of people have. I am struggling with this one. I am sorta of a character set completest I can easily disregard other premium items. The Shadowed Mayan God in the Halloween 2012 set mocks me every time I see it (didn’t start playing until waking day.) All I really want is The Mayan God to complete the set but 300 sprinkles seems a lot even with the other items you get with it. It’s hard to pass up something THIS old (especially when it impacts your character sets)…so I understand your dilemma!